In 1976, The Menomonee Falls Police Department formed its first Tactical Enforcement Unit. On January 1, 2006, in an effort to maximize resources within Waukesha County, members of the Menomonee Falls Tactical Enforcement Unit (TEU) and Crisis Negotiation Team (CNT) consolidated with the Waukesha County Sheriff's Department Tactical Unit and became Special Deputy Sheriff's. 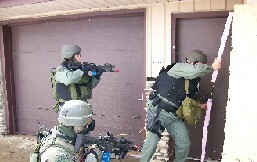 TEU and CNT are the equivalent of what is commonly known as a SWAT Team. The TEU members respond as one unit when needed for incidents requiring more expertise and specialized skills. The members are highly motivated, trained, and well equipped to diffuse volatile situations and reduce the risk of injury to all those involved. The members are full-time police officers of various ranks within the department and serve on the TEU as a collateral duty. The members receive monthly training in areas such as room clearing, officer/citizen rescue, vehicle/occupant control, high-risk warrant service, chemical agents, explosive breaching and firearms. Officers must successfully complete a rigorous testing process to be selected as TEU members, and serve at the pleasure of the Chief of Police and County Sheriff. Members are required to maintain proficiency with a variety of firearms not typically used in the day-to-day functions of patrol. Because TEU members receive specialized training, they are often used as a resource for the entire department, instructing department personnel during in-house training.